The Pioneer XDJ-R1 is a complete standalone wireless home DJ system with dual CD drives, a built-in 2-channel mixer, and MIDI controls all wrapped into one. 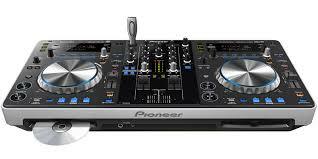 The XDJ-R1 is the most affordable entry incorporating Pioneer's USB Rekordbox music managing software, and includes high-end features taken from some of Pioneer's flagship professional DJ equipment. Pioneer XDJ-R1 Universal DJ System by Yunsshuang Electronics Co,Ltd at Pakbiz.com a premier Business to Business marketplace and largest online business directory. Find Pioneer XDJ-R1 Universal DJ System from Hong Kong complete basis & contact information, business offers, availability & related Consumer Electronics products. This page gives you information about the authentic sellers of this product. It allows buyers and sellers communication directly. It can also facilitate the buyers to purchase the product in reasonable prices.